Mr. G.S.Prasad, CEO, SAIL, Rourkela Steel Plant, lighting the lamp to mark the inauguration of the Silver Jubilee celebrations. 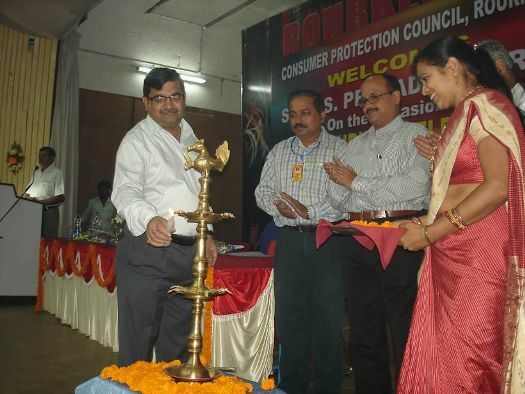 The Silver Jubilee Celebrations of the Consumer Protection Council, Rourkela was held at Rourkela Club at a function organized on Sunday, the 8th April. Mr. G. S. Prasad, CEO, RSP graced the occasion as chief guest and inaugurated the celebration by lighting the ceremonial lamp. Addressing the gathering, Mr. Prasad outlined the significance of the consumer movement in the country for the safeguard of the consumers’ interest and redressal of their problems. “We the customers should be adequately aware about our rights so as to prevent any exploitation. The Consumer Protection Council, Rourkela has been rendering a great service in the Steel City for the past twenty five years and has now reached an important and significant stage of its Silver Jubilee,” he said. Earlier Mr. Prasad also released the Silver Jubilee souvenir of the Council published to mark the occasion. In his address Mr. B. Vaidyanathan, the Chief Mentor of the Council and one of the leading consumer protection activists presented a brief about the consumer movement in the country and involvement of people in it. Elaborating on the establishment and achievement of the CPC, Rourkela, he shared about how the grievances of a number of consumers were redressed because of the fight of the Council. He said that he was eagerly awaiting the decision of the Supreme Court in the LPG short-weighment case. He declared that it was his dream to make the Council and Rourkela achieve highest level of glory in the consumer movement. Earlier Mr. P. Karunakaran, President of the Council in his welcome address presented a brief about the 25- year long journey of the Council. Mr. R. R.Bitra, Secretary, read out the secretarial report. In recognition of the extraordinary support given to the Council’s activities in the past, Mr. B.Panda and Mr. A.P.Biswal were presented mementoes. Mr. Sanjaya Sahu, Chartered Accountant, of M/s Roy & Sahu Co. Ltd. was also recognized for his continued service to the Council, on honorary basis. The function concluded with a vote of thanks by Mr. B.Pradhan, Vice President of the Council. 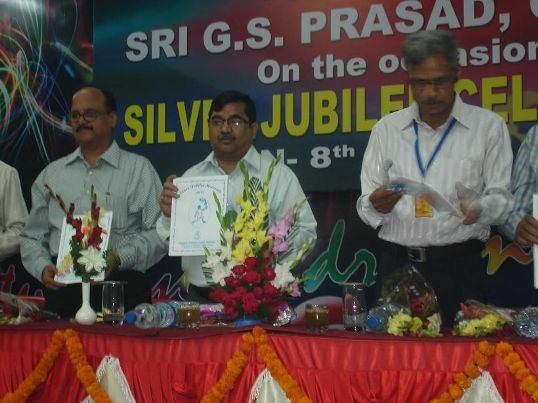 Mr. G.S.Prasad, CEO, SAIL, RSP, releasing the Silver Jubilee Souvenir.